Purpose : To study the accuracy of different recent intraocular lens (IOL) calculation formulas in predicting a target postoperative refraction ± 1.0D (Diopters) in patients with long eyes (axial length ≥ 26.0 mm) undergoing phacoemulsification. Materials and Methods : This study comprised 127 eyes of 87 patients who presented with cataract and axial eye length ≥ 26 mm. 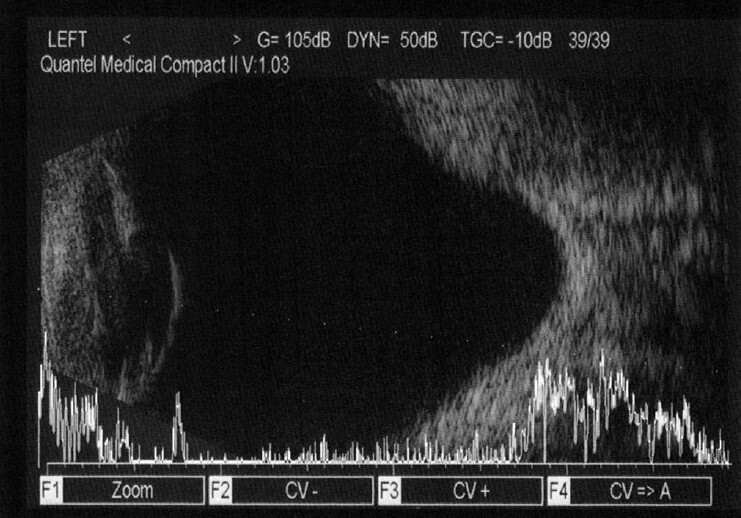 Before phacoemulsification and IOL implantation; axial length measurement using immersion ultrasound A-scan technique, and autokeratometry with or without computerized corneal topography for K readings were done. The IOL power was calculated using four formulas, namely the SRK-T, Hoffer-Q, Holladay-2, and Haigis formulas. Four months after surgery, refraction was done. Differences between actual postoperative refraction and assumed target refraction using the different formulas were analyzed. P < 0.05 was considered statistically significant. 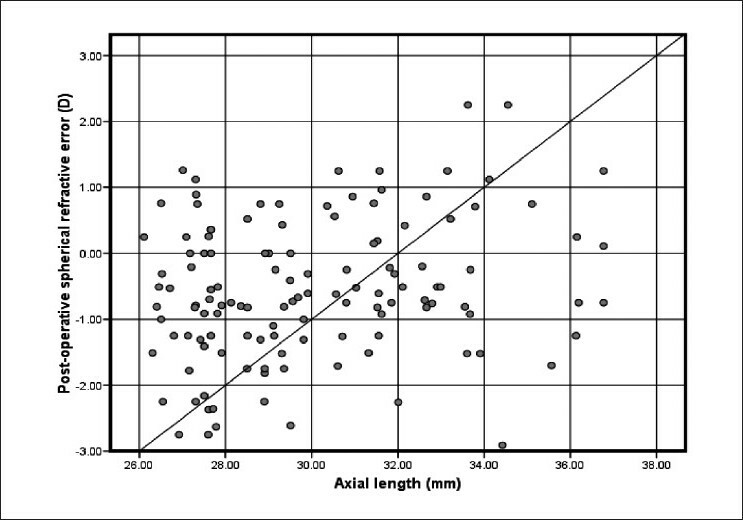 Results : In all 127 eyes, the mean axial length was 31.71 mm (range, 26.06-37.11 mm) and the mean K was 44.68 D (range, 40.05-55.14D). The mean preoperative spherical equivalent (SE) was -17.52D (range, -12.25 to -30.50D). After surgery, the mean spherical equivalent was -0.8 ± 0.83D (range, +1.25 to -3.75D). The mean postoperative refractive SE when implanting a plus power IOLs was -0.3 ± 0.51D (P < 0.001) while the mean postoperative refractive SE when implanting a minus power IOLs was +1.21 ± 0.11D denoting a highly significant tendency toward hyperopia (P < 0.001). Concerning the minus power group, most postoperative refractive error was within +1.0 to +2.0D in the actual implanted IOL and in all other formula calculated IOL power. However, Haigis formula showed the least deviation while SRK-T and other formulas showed a greater tendency toward hyperopia. Conclusions : In eyes with high axial myopia, the performance of SRK-T, Hoffer-Q, Holladay-2 and Haigis formulas are comparable in low plus-powered IOL implantation. Haigis formula is the best formula when minus power IOL is implanted. The aim of the study was to evaluate the performance of different recent IOL power calculation formulas (SRK-T, Hoffer-Q, Holladay-2, and Haigis) in predicting a target postoperative refraction ±1.0D in long eyes (axial length, 26.0 mm or more). This was a prospective comparative study. After explaining the details of the study, we obtained written informed consent from all patients before enrollment. The study was approved by Mansoura University Hospital Trust Ethics Committee and was carried out in accordance with the Declaration of Helsinki (1989) of the World Medical Association. This study included 127 cataractous eyes of 87 patients with high myopia and axial lengths ≥ 26.0 mm attending the Mansoura Ophthalmic Center, Mansoura University, Egypt scheduled to undergo phacoemulsification. Patients with history of previous ocular surgery, posterior segment disorders, eventful cataract surgery, keratoconus, endothelial dystrophy, and glaucoma were excluded. Preoperative examination included uncorrected and corrected distance visual acuity measurement, slit lamp biomicroscopy, Goldmann applanation tonometry, and indirect ophthalmoscopy after mydriasis. The axial length was measured using A-scan ultrasonic biometer (Compact II, Quantel Medical, Clermont, Ferrand, France). In all cases, the immersion ultrasound A-scan technique was used. In eyes with dense cataract and poor fixation, combination A/B-scan method used. The B-scan axial length was determined by estimating an optical line through the eye (perpendicular to the cornea and lens) thus ensuring precise centration of the corneal peak. Therefore, in the presence of an eccentric staphyloma, the axial length chosen for biometry calculations did not necessarily represent the maximum geometric axial length of the eye [Figure 1]. As the B-scan allows visualization of the fovea, the retinal peak of the A-scan was aligned more exactly with it to avoid measurement of a staphyloma. The corneal power (k) was measured using autokeratometer (NIDEK, autokeratometer KM 500, Gamgori, Japan). However, in some cases, computerized corneal topography was performed (Topo Shin Nippon CT 1000, Tokyo, Japan). Preoperative IOL power calculations were performed using SRK-T, Hoffer-Q, Holladay-2, and Haigis formulas in all patients. The surgeon's goal in IOL power selection was a lens power that would yield a postoperative refraction ±1.0D. The IOL formula that provided a lens power with the above postoperative refraction was selected. Phacoemulsification was performed through a sutureless 3.0-3.5 mm clear cornea incision, an anterior capsulorhexis of 5.2-5.5 mm, and a posterior chamber 3-piece hydrophobic foldable acrylic IOL (I-Medical, Weinheim, Germany) was implanted in the capsular bag. The patients were followed up for 4 months. Patients were examined 1 day postoperatively, then every week for the first month, then monthly for uncorrected and corrected distant visual acuity, autokeratometry, and fundus examination. All data were analysed with the SPSS version 15 (SPSS Inc., Chicago, IL, USA). Values were recorded as mean ±SD (standard deviation). A paired t-test was used for parametric comparison of the means. The mean axial length measurements and biometry errors were calculated. Deviation of the actual postoperative refraction from the assumed target preoperative refraction calculated and evaluated using a two-way analysis of variance (ANOVA). This spherical equivalent deviation was retrospectively compared to the different IOL formulas in this study. The confidence interval was 95% and P < 0.05 was considered statistically significant. This study included 127 eyes of 87 patients (32 males and 55 females). Their age ranges from 42.5 to 63.0 years. The preoperative mean spherical equivalent refraction was -17.52 ± 4.01D, the mean corneal power was 44.68 ± 3.01, and the mean axial length was 31.71 ± 3.01 mm [Table 1]. Plus power IOLs were implanted in 60 eyes (plus-IOL power group), plano power IOL in 12 eyes, whereas minus power IOLs were implanted in 55 eyes (minus IOL power group). The percentage deviation of refractive outcomes from the calculated IOL power, in the plus and minus power groups, in each IOL formula group is seen in [Table 2] and [Table 3]. In the plus power group [Table 2], most postoperative refractions lay between 0.00 and -1.00D of the actual implanted IOL in all formula groups. On the other hand, in the minus power group [Table 3], most postoperative refractions were within +1.0 to +2.0D of the actual implanted IOL in all formula groups. However, Haigis formula showed the least deviation while SRK-T and other formulas showed a greater tendency toward hyperopia. 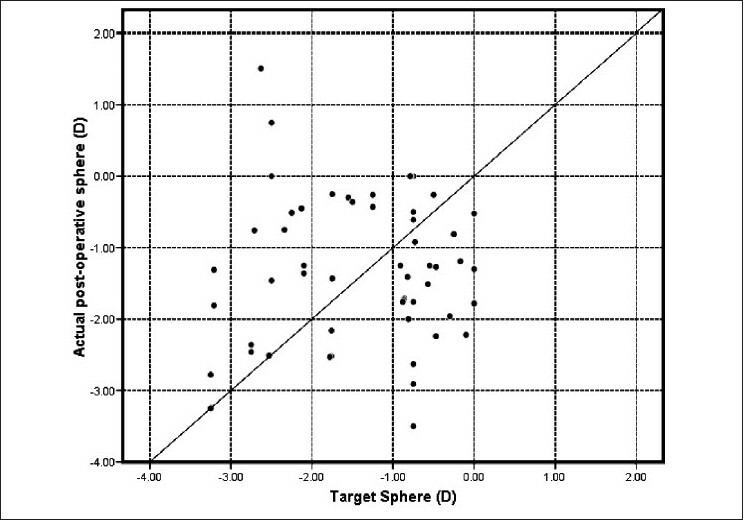 [Figure 2] shows a scatter plot of the target and actual postoperative refraction in plus power IOL group. Almost all postoperative refractions shown on the vertical axis are within the expected target refraction on the horizontal axis. The diagonal line represents the ideal correlation between the target and postoperative refraction. On the other hand, the scatter plot [Figure 3] of the minus power IOL group shows a positive bias to the biometry prediction. 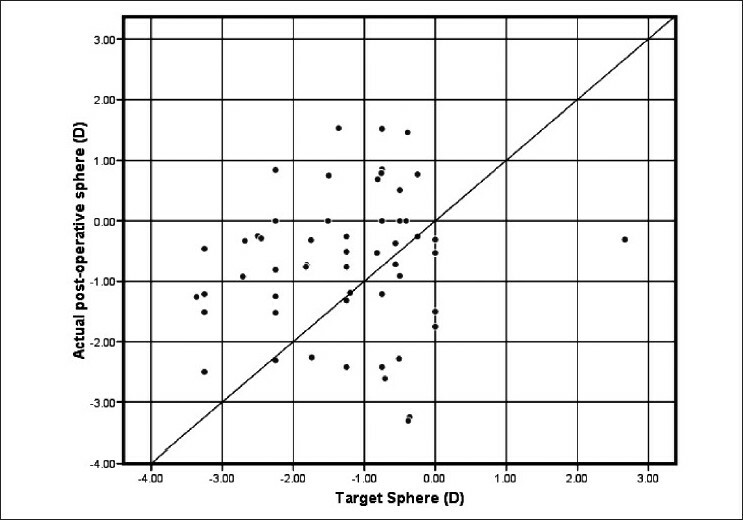 [Figure 4] shows the correlation between axial length and postoperative spherical refractive error in the study group. It was noticed that hyperopic refraction is consistent with axial length more than 31.0 mm. In this study, we studied the refractive outcome of four different IOL power calculation formulas (SRK-T, Hoffer-Q, Holladay-2, and Haigis) in eyes with high myopia. The predictive capability of the four formulas is more or less satisfactory in the low-plus-power IOL group. The postoperative SE was ±1.0D of assumed refraction in 75%, 63%, 57%, and 66% of cases when using the four formulas preoperatively. In the minus IOL power group, there was an overall tendency toward hyperopia. The refractive outcome was within +1.0D in 45%, 53%, 58%, and 69%, respectively. The performance of Haigis and Holladay-2 are better than Hoffer-Q and SRK-T formulas. Zaldivar et al. reported that 92% of eyes were within ±1.0D when using SRK-T, 88% with Hoffer-Q in cases of plus power IOLs and in 54% with the SRK-T and Hoffer-Q formulas 63% with the Holladay-1 and 41% with Holladay-2 formulas in the case of minus power IOLs. Petermeier and Szurman  reported the SRK-T, the Haigis, and the Holladay-1 formulas resulted in a mean hyperopic refractive error of +0.84D (SRK-T), +0.67D (Haigis), and +1.18D (Holladay-1), respectively, but within smaller range (SRK-T -0.55 ± 1.79D), Haigis (+0.04 ± 1.56D), Holladay-1 (-0.1 ± 2.07D). The mean axial length in this study was 32.35 mm (range, 29.22-36.51 mm). The improved predictive capacity in eyes in which plus power were implanted is probably related to the improved accuracy of axial length measurements in these relatively shorter eyes. The mean axial length was 29.61 ± 1.57 mm in patients receiving plus power IOLs and 33.32 ±1.51 mm in those receiving minus power IOLs. In eyes with axial lengths ≥ 30.0 mm, a posterior pole staphyloma temporal to the fovea was common, and the corneal vertex-fovea distance was approximately 0.5-1.5 mm, shorter than the distance from the corneal vertex to the bottom of the staphyloma, which is where the A-scan usually finds the perpendicular axis and records the axial length. Immersion ultrasound A-scan reveals the anterior and posterior corneal peaks compared to a single peak with the applanation method. These two peaks of immersion technique may be a judge to the optical axis. Additionally, applanation method indents the cornea resulting in corneal compression between 0.14 and 0.47 mm. The immersion method measures the axial length from the anterior cornea to the inner-limiting membrane. The main disadvantage of immersion method is that misalignments may occur with the transducer probe, and the ultrasonic beam may not be perpendicular to the intraocular surface. This results in a jagged retinal peak or the absence of a posterior lens peak on the A-scan. This study shows a similar refractive outcome as that reported by Zaldivar et al. and MacLaren et al. They showed a hyperopic tendency with minus power IOLs especially when SRK-T formula was used, and this tendency decreased with the Haigis formula. Each formula has an A-constant associated with predicting the estimated lens power. The Holladay-1 formula uses a surgeon factor that is the distance between the iris plane and the power plane of the IOL, where the distance from the cornea to the iris plane is calculated as the dome height of the cornea. The Holladay-2 and Hoffer-Q formulas use an anterior chamber depth (ACD) constant which is the average distance between the power plane of the cornea and the IOL. The SRK-T formula uses the A-constant supplied by the manufacture of the IOL. The Haigis formula uses three constants: a0, a1, and a2. The a0 constant works in a similar manner as the constants for the other formulas. The a1 constant relates to the measured ACD (anterior corneal vertex to anterior vertex of crystalline), and the a2 constant to the measured axial length. Terzi et al. and Haigis  concluded that optimization of lens constants improved the accuracy of IOL power calculation. Also, Petermeier et al. found that with optimized constants, the SRK-T, Haigis, Hoffer-Q, and Holladay-1 formulas produced small deviation of postoperative refraction from target refraction. In eyes with high myopia, the performance of SRK-T, Hoffer-Q, Holladay-2, and Haigis formulas is good in low plus-powered IOLs implantation. However, a hyperopic refractive outcome is anticipated with minus power IOL implantation. Haigis formula is the best one when minus power IOL is implanted. The authors thank Taha Baker for his care and diligence during writing of this paper. 2. Hill WE, Byrne SF. Complex axial length measurements and Unusual IOL Power Calculations, In: Points F. Clinical Modules for Ophthalmologists. San Francisco: American Academy of Ophthalmology; 2004. p. 22-9. 3. Garg A, Hoyos JE, Dementiev J. Update on IOL power calculations formulas, in Mastering techniques of IOL power calculations. New Delhi: Jaypee Brothers; 2005. p. 16-22. 6. Zaldivar R, Shultz MC, Davidorf MJ, Holladay JT. In­traocular lens power calculations in patients with ex­treme myopia. J Cataract Refract Surg 2000;26:668-74. 7. Petermeier K, Szurman P. Accuracy of intraocular lens power calculation for the Acrysof; MA60MA in highly myopic patients. Book of abstracts. Stockholm, Sweden: XXV congress of the ESCRS; 2007. p. 114. 9. MacLaren RE, Sagoo MS, Restore M, Allan BD. Biometry accuracy using zero - and negative-powered intraocular lenses. J Cataract Refract Surg 2005;31:280-90. 11. Kora Y, Koike M, Suzuki Y, Inatomi M, Fukado Y, Ozawa T. Errors in IOL power calculations for axial high myopia. Ophthalmic Surg 1991;22:78-81. 14. noneHaigis W. Intraocular lens calculation in extreme myopia. 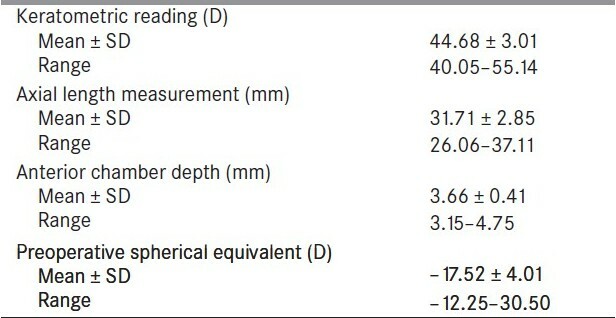 J Cataract Refract Surg 2009;35:906-11. 16. Haigis W. The Haigis formula. In: Shammas HJ, editor. Intraocular lens power calculations. Thorofare, NJ, USA: Slack Inc; 2003. p. 41-57. 17. Biometrie HW. Yearbook of Ophthalmology 1995. In: Kampik A, editor. Optics and Refraction. Zuelpich: Biermann Verlag; 1995. p. 123-40.